Boehners sudden and surprising resignation threatens to further divide his caucus. (Bloomberg) — House Speaker John Boehner will resign from Congress at the end of October, lawmakers said, following repeated clashes with conservative members of his Republican conference including a potential government shutdown next week. Boehner is citing the defeat last year of former No. 2 Republican Eric Cantor and his meeting this week with Pope Francis as among reasons, according to a Republican aide. There is no obvious successor. He announced his decision to rank and file Republicans Friday morning. 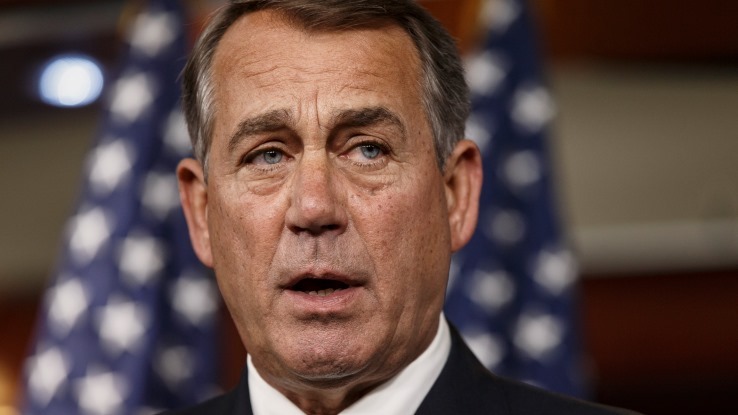 Boehner believes, the aide said, that any speaker’s first job is to protect the institution. The speaker believes putting members through prolonged leadership turmoil would do irreparable damage to the institution, the aide said. Boehner’s sudden and surprising resignation threatens to further divide his caucus, as Boehner’s loyalists lashed out at those in the caucus who had threatened to try to topple Boehner. “The honor of John Boehner today is in sharp contrast to the idiocy of those in the conference who seek to divide us,” said Representative David Jolly, a Florida Republican. Boehner, an Ohio Republican who has been speaker since 2011, has faced pressure from conservatives in his caucus on a spending plan for fiscal 2016. Some Republicans want funding cut off for Planned Parenthood, the women’s reproductive health service, and are willing to risk a government shutdown over the matter. The new fiscal year begins Oct. 1. “He does not want to become the issue,” said Representative John Mica, a Florida Republican, after the meeting of House Republicans. – With assistance from Terrence Dopp in Washington.